LCA Bishop John Henderson (left) and Assistant Bishop Andrew Pfeiffer have been re-elected for another synodical term. 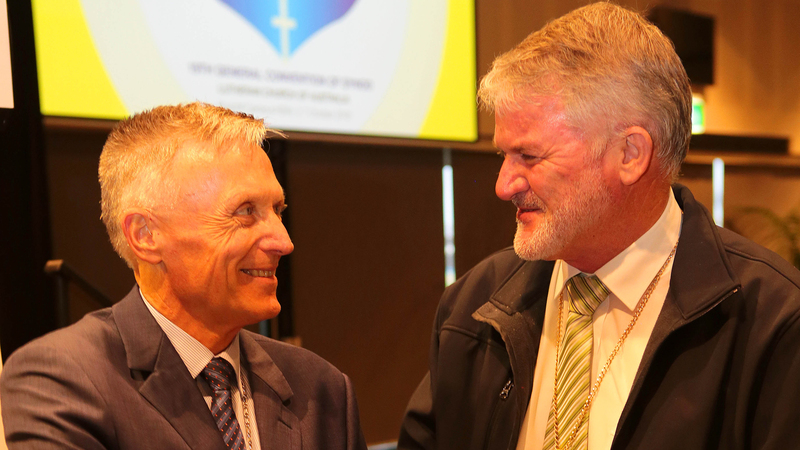 Pastor John Henderson has been re-elected as LCA Bishop for the next three years. Bishop Henderson and incoming LCA Assistant to the Bishop – International Mission Pastor Matt Anker were the two candidates nominated for the role by the LCA’s recent General Pastors Conference (GPC). Assistant Bishop Reverend Dr Andrew Pfeiffer was also returned to his role by Synod. There were no other nominations to that role. Rev Dr Pfeiffer is also Lecturer in Pastoral Theology, Coordinator of Pastoral Studies and Coordinator of Vicarage at Australian Lutheran College, where he has taught students for more than 20 years. Bishop Henderson was ordained as a pastor of the LCA in 1982. He was Principal of Australian Lutheran College from 2009 to 2013, General Secretary of the National Council of Churches in Australia from 2002 from 2008, and served in parish ministry in Victoria, Queensland and South Australia between 1983 and 2001, having done his vicarage in New Zealand in 1981. He was Vice-President of the LCA from 2006 to 2011 and Vice-President of the LCA’s Victorian District from 1998 to 2000.